If you want to score a high-paying job these days, your best bet is to turn to the IT industry. This career path tends to offer some great opportunities, whether it be concerning the salary or otherwise. Today, in this cyber security salary article, I would like to tell you about a job that is often overlooked. When we think about IT, the most common things that come to mind are often software or web development, programming and coding, data management, etc. However, cyber (information) security and analysis is just as important of a job as the ones mentioned above. Furthermore, people say that it may also easily compare salary-wise. At the very beginning of this cyber security jobs salary tutorial, I’ll tell you about the job title itself. We’ll briefly go over what it entails, what different information security jobs are there, what do these professionals do for a living, etc. Once that is said and done with, we’ll also shortly go over the main types of cyber security experts that are out there. We’ll do this so that you could get a better picture of why the cyber security salary is what it is. Finally, we’ll move on to discussing the salary itself. So then, let’s take it from the top. Who is the typical cyber security analyst and what does this person do? Cyber security analysts are mostly concerned with networks. This is sort of implied in the job title itself. These people have a very wide range of responsibilities, though, and all of them revolve around keeping a specific network safe, up and running. First of all, the main priority of these people is to closely observe company-specific networks and to maintain a high level of security. This can be done in a wide variety of ways, such as applying penetration testing, educating the rest of the company’s staff about security-based software, observing the industry trends and being able to apply them in the workplace, and so on. If and when something does go wrong, however, it is the responsibility of cyber security analysts and engineers to fix the problem. This mostly concerns engineers, but analysts may also get involved. While engineers are concerned with actually fixing the problem, information analysts have to identify the issue, investigate and document it, and work together with the whole security team to ensure that such a problem does not repeat itself. While there are very specific differences between information analysts and engineers (i.e. the cyber security analyst salary is different from the cyber security engineer salary), these two professions may overlap in some companies. With all of that said, you should now have a pretty good idea of what information analysts do. Now, before moving on to the cyber security salary, let’s talk about the different groups of information analysts that there are. Different jobs have various different titles attached to them. These titles are used mainly to identify a person’s skill level and experience in that specific line of work. However, they are also important when it comes to the whole working process itself. Let me give you an example. Imagine that you’re an employer of a small start-up company. You meet, interview and hire two people, both for the designer job position. However, one of those people has ten years of experience of working as a designer, for multiple different companies, while the other is fresh out of the university and this is his or her first job. Needless to say, you will probably want to pay these people different salaries that would be in line with their experience, but this is not where the differences end. The two new employees would probably perform different tasks, all of which would be comfortable for their skill level and experience. Furthermore, you might want to focus on more learning-based tasks when it comes to the newbie, and assign the more difficult, deadline-specific tasks to the experienced designer. The industry newcomer would possess the job title of an “entry-level designer”, while the person with ten years of experience would be called either a “junior designer” or perhaps even a “senior” one. As you can see, these titles actually make a pretty significant difference – the same applies to the information analyst job. And the differences don’t only stop at the cyber security salary! That being said, let’s briefly analyze the three main groups of cyber security analysts mentioned above. Once you have a thorough understanding of how these three groups are different from one another (and what different responsibilities and requirements they offer), we’ll be able to move on to discussing the cyber security analyst salary. The entry-level (also sometimes referred to as the “beginner”) cyber security analyst group can be seen as the most optimistic and motivational group out of the three. This is because most of the people that fall into this category are still very young and don’t have any experience of working in a real job. They might be driven by the cyber security analyst salary or the cyber security engineer salary, or might have a genuine passion for cyber security, in general. Whatever the case might be, there are new people like this coming into the industry every single day. Entry-level cyber security analysts often have generally simple, very learning-based jobs. Since it’s the absolute beginning of their careers, both these people and their employers know and understand that these beginners still have very much to learn. That’s why some companies even offer training programs for new, entry-level employees – that’s actually a really good way to start! When it comes to the entry-level cyber security salary, things can go two ways. On one hand, if a beginner information analyst manages to find a stable, long-term job in a company, he or she will probably receive a minimum cyber security salary that will grow with time, assuming that they will also work hard and learn quickly. On the other hand, a lot of beginner cyber security analysts don’t get paid at all. This is because many beginners have to get a certain amount of hours worked in a company for their university credits. Often times, these practices are not paid – it does, however, depends on the company and university in question. The junior cyber security analyst is usually the typical person that you would imagine when you hear the phrase “information analyst”. These are people who have either recently acquired their university degrees in computer science (or any other related field of expertise) or have finished some sort of an individual learning program, and are now looking for a stable job. Junior analysts, as opposed to entry-level ones, often have some experience in the field – they have either worked some odd jobs related to the subject in question, or have participated in some projects or anything of the similar kind. Whatever the case might be, the point is that junior information analysts usually already know what they’re doing, at least to an extent. Actual workflow-wise, the junior group of people handles the most common, every-day tasks that their employers might assign to them. These tasks are usually less learning-based than the ones issued to beginner analysts, but they still offer valuable new information. Furthermore, junior cyber security analysts require a lot less supervision when compared to their less-experienced peers – they have more room to think of their own solutions to potential problems, and to then experiment with their implementation. The junior cyber security analyst salary is a really complicated topic to deal with. This, however, isn’t a unique feature exclusive to this profession – in almost every line of work, the junior group is the most difficult to analyze. Why? One word – overlap. Since the junior group is in the middle between the beginner and the senior ones, there’s bound to be some confusion as to when a beginner becomes a junior, or a junior becomes a senior. This mostly due to the fact that there are no clearly defined boundaries separating the groups – it’s all situation, company and context-dependent. With that in mind, you can probably understand why the junior cyber security salary tends to be very inconsistent. Admittedly, that’s true with most of the salaries on this list (they are all volatile, thus being very prone to change), but it’s especially evident with the junior group of information analysts. The final group of the three main types of information analysts, the senior workers are the biggest professionals of the field. Senior cyber security analysts are often the leaders of their own, respective teams. They work with maintaining the networks from a high-profile type of environment. This means that the daily tasks that these people deal with are rather complex and require a whole team of professionals to manage. Furthermore, in addition to pen-testing and issue solving, senior information analysts are often assigned with the task of mentoring the newcomers to the company. This is common practice, however – these things happen in most lines of work. 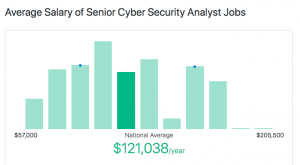 When talking about the senior cyber security analyst salary or the senior cyber security engineer salary, it is worth mentioning that these workers get paid the biggest amount of money in this industry. That might be a no-brainer, though, since they are the best that this industry has to offer. At this point, you should have a pretty good idea about the different types of cyber security analysts that there are, and about the varying cyber security jobs salary. However, knowing that the cyber security salary can vary isn’t enough – you came here for the numbers. And numbers are exactly what we’re going to discuss next. Let me just quickly emphasize that the salaries provided below are just estimations that can change at any given point in time. They should be used as a reference, rather than a cold, indisputable fact. Let’s begin by talking about the entry-level cyber security salary. As I’ve mentioned earlier on in the article, the beginner cyber security salary depends on a few different variables – these variables can influence the number to be both much smaller and much bigger, so do keep that in mind. Although it’s really difficult to find a stable, specific number to reference, Businessinsider.com states that the average cyber security salary revolves around the $80,000 USD annually mark. This would equate to approximately $6660 USD per month! Honestly, keeping everything in mind, this turns out to be an amazing salary! These estimations are based in the US, where the average monthly salary is around $3700 USD (as of writing this article). When you consider this fact, the beginner cyber security salary seems even more awesome. 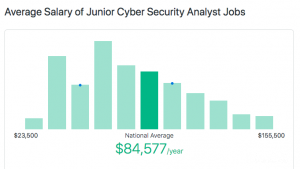 As stated earlier, the junior cyber security salary is a difficult thing to analyze. Still, Ziprecruite.com does provide a specific number that you could reference when thinking about the junior group of analysts. According to the site, junior cyber security analysts should make around $84,600 USD per year, or $7050 USD per month. This makes perfect sense, especially when you compare this junior cyber security salary to the beginner one. According to ZipRecruiter, a senior cyber security analyst can expect to make around $121,000 USD per year. This comes out to be a jaw-dropping $10,080 USD per month! That a huge jump from the expected salary of the junior group! With this information, it would make sense to think that the senior information analyst requirements are much higher when compared to those of a junior one. 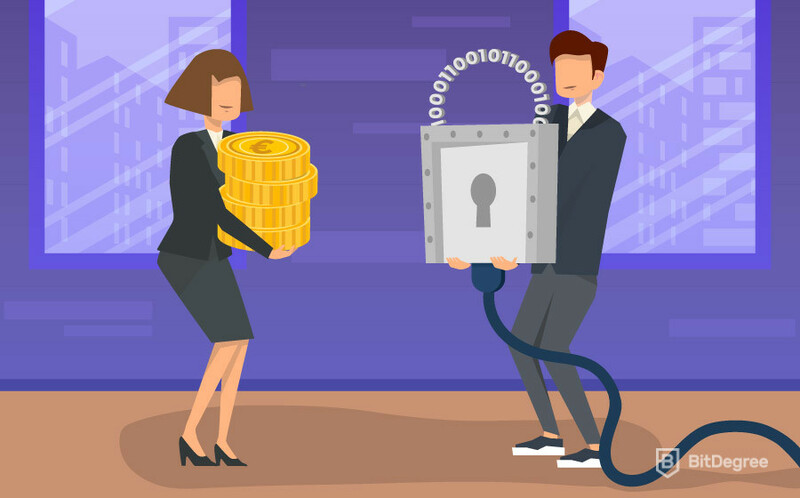 In this article, we have covered all of the essential information about the cyber security salary. 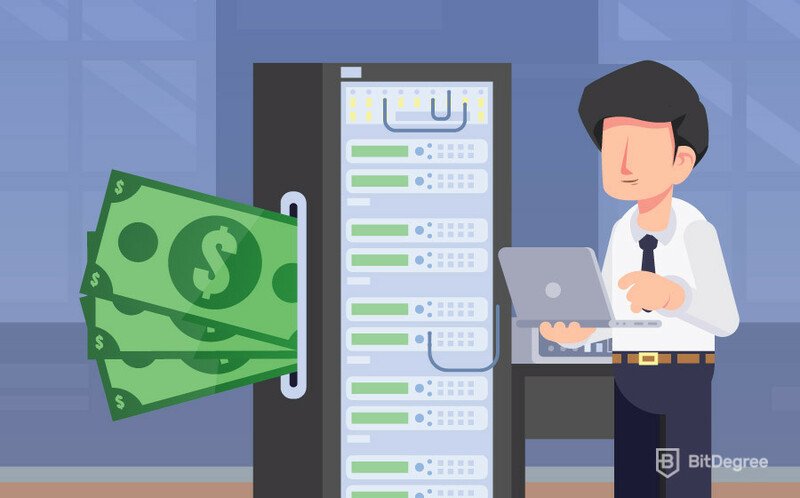 You should now have a better idea of not only the salaries that cyber security analysts make, but also about the different kinds of analysts that there are, as well as their individual job descriptions (albeit very short ones). I honestly hope that the information provided in this cyber security jobs salary article was useful to you, and that you’ve found what you were looking for. Thank you for reading, and don’t hesitate to check out some other salary-related articles on this page! Cheers!